To mount the spindle, I drilled a 5/8" diameter hole through the headstock block, then wrapped some sandpaper around a 1/2" dowel and sanded the interior of the hole just enough to let the spindle turn smoothly, but not so much that it was rattling around in the hole. The friction plates on the entry and exit sides of the hole are made from 1/8" thick UHMW plastic. 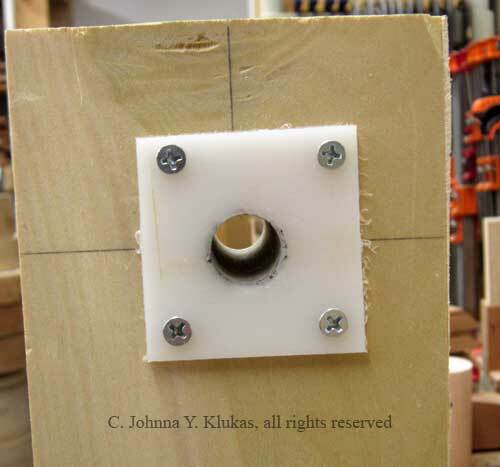 This plastic is used in jigs and such, is slippery and sturdy but easy to machine. It's available in various sizes from most woodworking retailers. I cut the plates on my bandsaw and drilled it with a 5/8" forstner bit without any difficulty. Since glue doesn't stick readily to UHMW plastic, I screwed the plates into position with small wood scres set into countersunk holes. Note that you could also use thin maple or other hardwood to make the plates, and apply a little wax to make things turn smoothly. 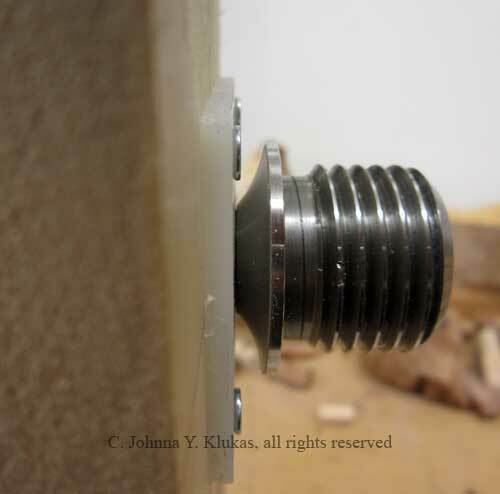 If you look closely at the spindle, it has a tapered shoulder behind the threaded area. I was concerned that this taper would dig into the soft poplar over time, and the friction plates help to prevent that also.